Shrouded in darkness, Kara-Lis Coverdale played to a rapt audience that mostly opted to sit cross-legged on the floor. Digging deep into her repertoire of folky, medieval chamber drones, the Montreal composer mixed together the sacred sounds of church organs, Gregorian chants and harps, carefully constructing a dense and deeply meditative pastoral sound environment that successfully distracted from the fact that we were all listening to it in a newly renovated basement space, as if catapulting us to a different plain entirely. 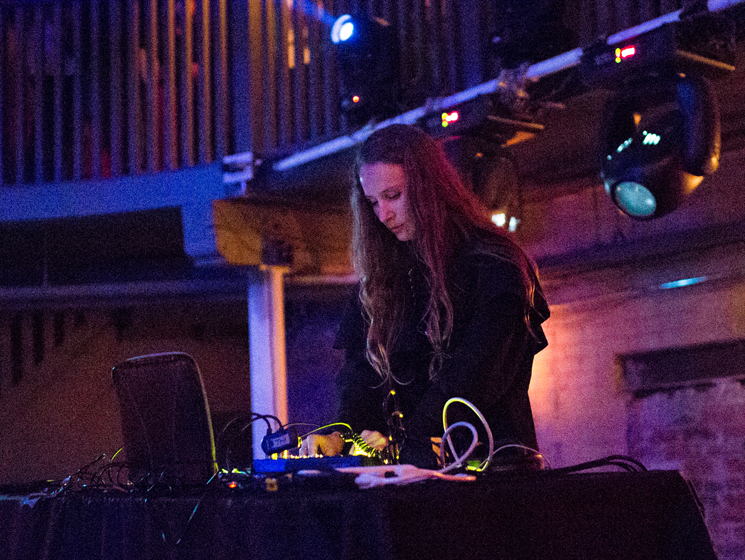 Throughout the set, she bridged that world of sonic paganism with a bag of more modern ambient electronic sounds, deploying shimmering arpeggiators and reverb to dramatic, moving effect, but the shifts were handled gently enough to keep everything within a realm of new age bliss. This was heavy, detailed and entirely enchanting stuff.